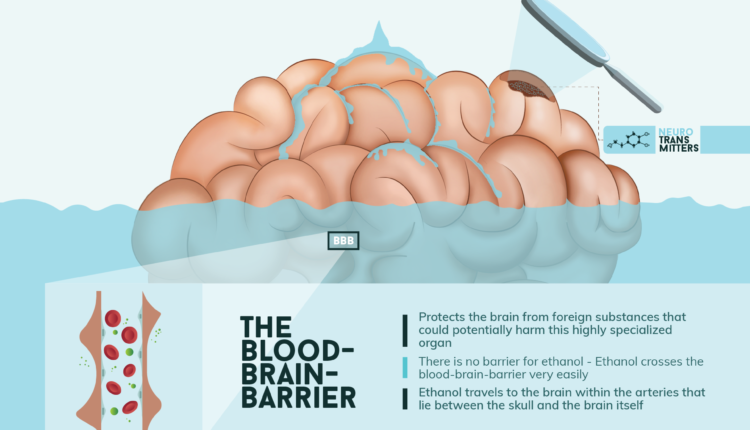 When you drink alcohol, it makes a journey through your body. It passes through several organs and affects them in different ways. The first organ it reaches is the mouth. Some of the effects of alcohol in the mouth include tooth loss, gum disease, and tooth decay. If you’re a smoker, alcohol increases the absorption of cancer-causing chemicals in tobacco. From the mouth, alcohol travels to the esophagus. This organ is lined with mucosa, a moist tissue very vulnerable to alcohol. Even after one episode of heavy drinking this tissue can be damaged. It can weaken the lower esophageal sphincter and produce gastroesophageal reflux. This, in turn, produces heartburn. It can also cause “Nutcracker Esophagus”. This is a disorder that affects the contraction in your esophagus and causes heartburn. Heavy drinking is also linked to esophageal cancer. A syndrome called Barrett’s esophagus changes the cell layer lining of the esophagus and causes abnormal acid production. The altered cells can become cancerous. 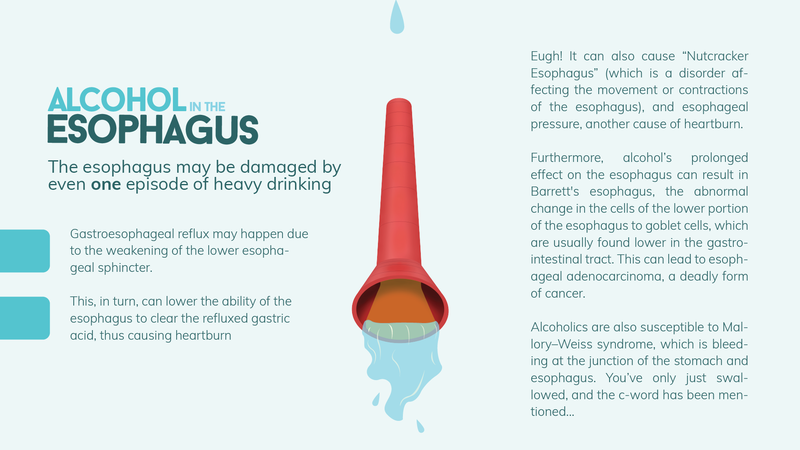 After the esophagus, alcohol gets to the stomach. The effects of alcohol in this organ range from mild irritation to serious diseases. Short-term symptoms include vomiting, abdominal pain, diarrhea, and bleeding. 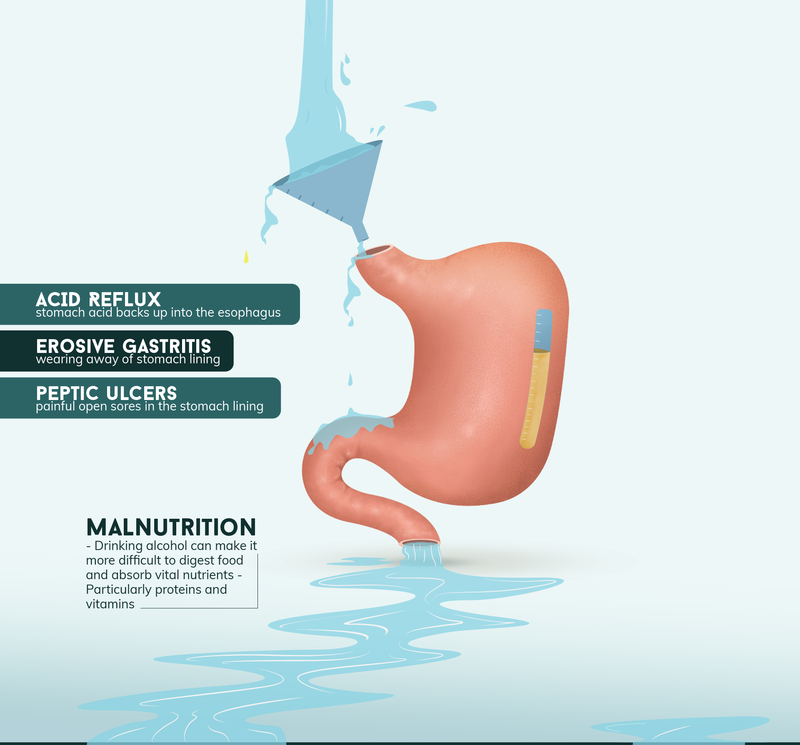 Long-term alcohol abuse can cause gastritis, which is when your stomach produces more acid than usual. It could also result in ulcers, given that the excessive acid production irritates the mucosa. Alcohol abuse can also cause malnutrition since it makes it more difficult for your stomach to digest food and absorb nutrients. Alcohol affects the heart too. Alcohol causes high blood pressure. In turn, high blood pressure can produce blood clots, which can result in stroke and brain damage. Other effects include congestive heart failure and alcoholic cardiomyopathy. This is a condition in which alcohol enlarges and weakens the heart and can lead to complications. The organs that suffer the most from heavy alcohol consumption is the liver. It is your largest internal organ and it carries out different functions. Some of them include removing toxins, synthesizing proteins and producing hormones. 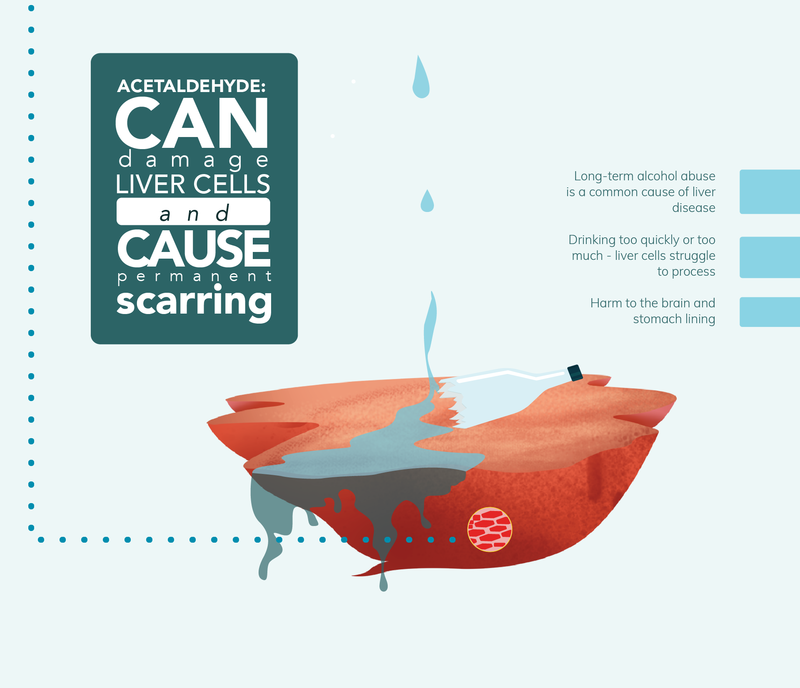 When your liver processes alcohol, it breaks it down into a chemical called acetaldehyde. This can cause alcoholic liver disease. It is a general term that includes fatty liver disease, alcoholic hepatitis, and cirrhosis. Continuing to drink after developing any of these diseases can cause liver cancer and death. 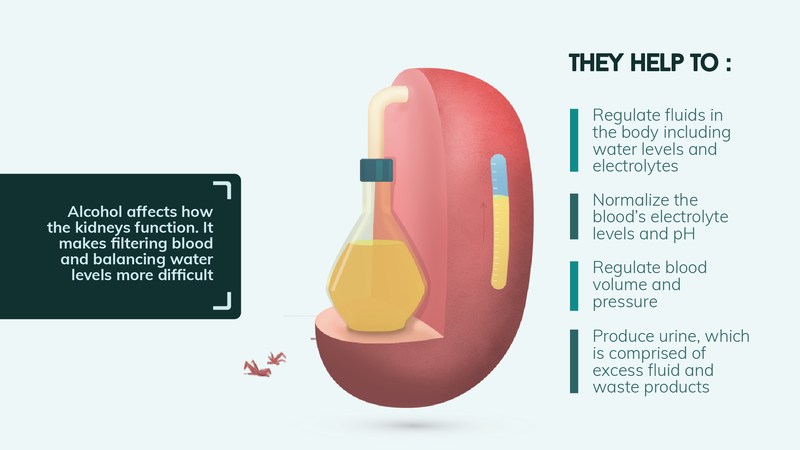 The kidneys are the organs in charge of filtering harmful substances from the blood. Alcohol makes it harder for them to do this job. It also dehydrates your body, which affects kidney function and increases high blood pressure. This can lead to kidney disease, acute kidney failure, and inflammation of the kidney. Last but not least, alcohol affects your brain as well. Feeling tipsy or drunk happens when alcohol reaches the brain. 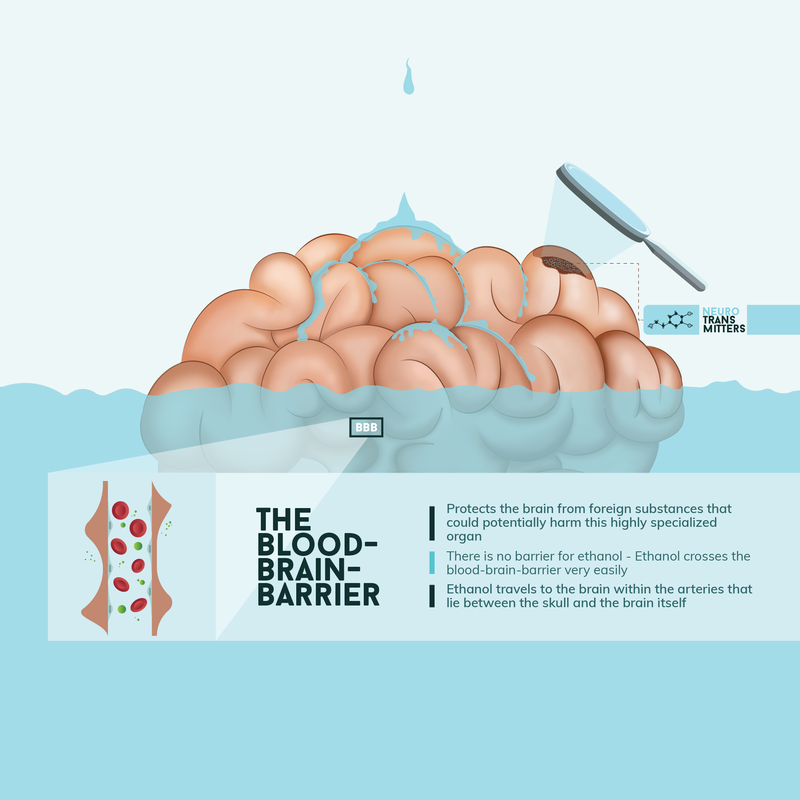 There is a natural barrier in your brain that protects it against harmful substances. However, ethanol can pass through it. Alcohol affects neurotransmitters, which are the body’s “messengers”. They transmit information between neurons. Alcohol alters neurotransmitters and prevents them from working correctly. This summary of alcohol’s journey through the body are the basic facts. You can learn more following the complete alcohol infographic.